I have been using it for 2 weeks. I can tell that it is really amazing. I have very light cellulite lines that I can see them disappearing. I use brush Mio Skin during 2 weeks and result is fantastic. Skin is elastic and smooth. I recommend to buy it who wants to get healthy and good looking skin. The first time I used it, it felt a bit harsh. But you get used to it. And you surely feel a difference after using it. Your skin feels smoother and Im hoping it will lessen my cellulite. Need to get used to it if you are new to brushing. It seems a bit too harsh brush when you use it first times, especially on belly or inside part of tights. Even on legs it seemed soo hard several times I tried to use it. My skin didn't get pink but it was not very pleasant. I'm totally new to body brushing. After several days you start to enjoy it and press harder but I still can't really use it on my belly. Brush is made very nicely and it comes with an instruction. I can't say yet that I see magical effect as I didn't use it long enough but I can tell that I feel more refreshed in general after brushing my body before shower. I think it would be fantastic if it came with detachable handle to make back brushing comfortable but it's ok, I mostly concentrate on my legs, arms and sides of body. I am using this brush for almost 4 months now, every day for a few minutes during the shower. I brush my whole body from feet to neck. I sometimes miss a day or two because I am away and I can say that I really miss when I don't use it. I have a cellulite problem that was quite severe and I could say that is probably 30% less visible. I am not kidding, my legs looks better, as well as my arms. After use I feel refreshed, my skin is soft and smooth, I have nothing but praise. I tried other dry brushes that don't appeal to me, I like this because I use it under shower and that saves me time. 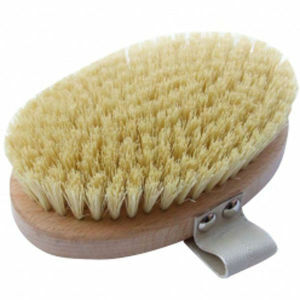 I decided to invest in a body brush after a spa treatment a few weeks ago which included dry body brushing. i'd only ever had this once before so both times I've had this done I've loved it. I've only been using the brush the last 2 days now but I have to say, right after using it (which I do, as recommended before my shower) my skin feels amazing and it actually just feels awake! I am definitely going to use this at least 5 times a week for the first month at least. The quality of it is also really great but I do have 2 small negatives: Firstly, the pouch this comes in is too small for it. Could really do with a slightly bigger pouch so you're not having to shove the brush back into it. Secondly, the handle on it is slightly too big to allow my hand to fit snuggly in between it and the brush so it's almost pointless having the handle on it. Apart from those 2 very small negatives, it's a great brush and I would highly recommend it, great value too compared to some other brushes on the market. Love it. It was just what I wanted. I heard a lot about dry brushing and though I should give it a try. 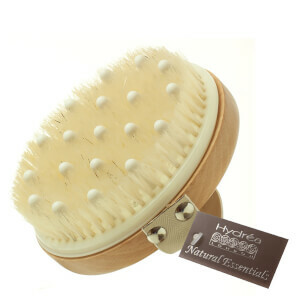 I absolutely loved this brush, I use it as instructed 3 times a week and it makes my skin feels smoother right away. Best time to use it is before shower. It also says that it impoves blood circulation. Great body brush. I've only ever used these brushes in the shower but this time used product recommendation & used on dry skin before shower! Love this product! It's the only thing that keeps the cellulite at bay!! Great before holidays & general skin care!